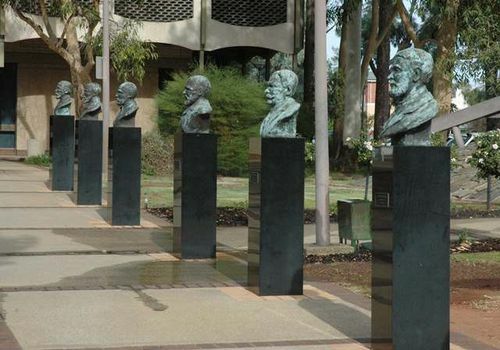 Sculptures depict the seven men who founded Broken Hill when they pegged claims for mining leases along the Line of Lode in 1883. Charles Rasp, a boundary rider on Mt Gipps Station was the first to do so. The other six men were fellow station workers, and included the manager of Mt Gipps Station. The syndicate - David James, James Poole, Charles Rasp, George McCulloch, Phillip Charley, George Urquhart, George Lind - discovered a mineral deposit of such size that it created Broken Hill and funded the country`s industrialisation. The men`s discovery was the foundation of not only the city, but of the biggest mining company in the world. These leases were the foundation for the forming of the Broken Hill Mining Company (BHP) in 1885, a company that went on to be the one of the most profitable in Australia's history.